The month of October 2017 saw an exceptional level of activity on the railway as the Heritage Lottery Project reached 80% completion. On Wednesday 11th October, the first of the three restored cars, No. 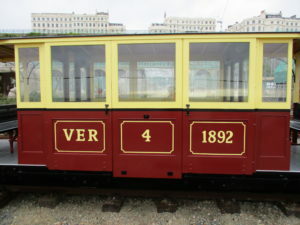 4, returned to Brighton. 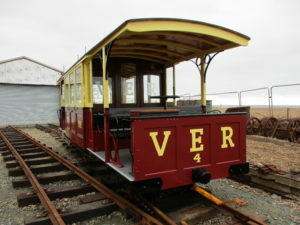 Two days later, on Friday 13th, a special ‘launch event’ took place at the new Aquarium Station and Visitor Centre followed the next day by the start of a limited ‘half-term holiday’ service between Aquarium and Halfway stations, operated entirely by VERA volunteers. Car 4, seen here before and after restoration, is a truly magnificent vehicle that is a testimony to the skill and dedication of Alan Keef Ltd who have been working on Cars 4, 6 & 10 for the past 18 months. Almost 40% of the original woodwork has been retained including the two bulkheads that are now in a mahogany varnished finish. A new underframe of oak and douglas fir was constructed using original drawings. 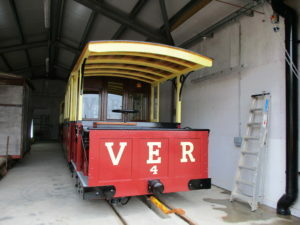 Although Car 4 has a motor fitted it could not be run as a new control system is still to be installed; this will take place during December/January. 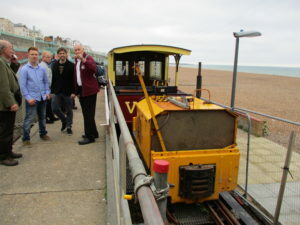 Weather for the ‘launch event’ was good and over 80 invited guests attended, including Councillor Robins, Bernard Volk (Magnus’ grandson) and Nicholas Owen (broadcaster and presenter). The finishing touches to the permanent exhibition had been finished only a few hours before the opening. Exhibits include an original model of ‘Daddy Longlegs’, a display of tickets and the original dynamo that powered the railway in 1883. 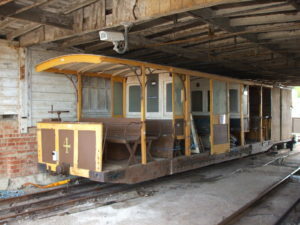 Car 4 was brought down to the station behind the diesel locomotive for inspection by the guests. 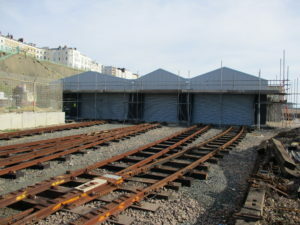 The new Depot and Visitor Gallery at Banjo Groyne will be completed in November and will enable the fleet of seven cars to be stored in dry, modern conditions. 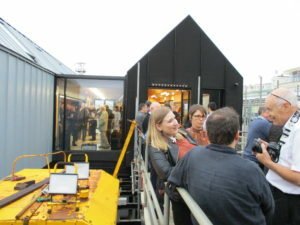 The Visitor Gallery will enable visitors to look through windows into the depot and see for themselves the work that goes on ‘behind the scenes’. A working model of the railway, built for the Centenary Year in 1983, will be installed and it is hoped to have this as a working exhibit.